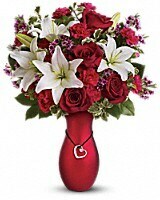 Wow her with this lovely bouquet of red roses and white lilies. Beautifully arranged in a lustrous red ceramic vase, featuring a silver-plated heart pendant with a 1-carat SWAROVSKI® ELEMENTS crystal - it is the perfect 3-in-1 gift! 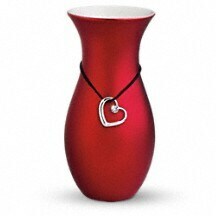 This romantic red ceramic vase is accompanied by a beautiful necklace featuring a silver-plated heart pendant with a 1-carat-sized SWAROVSKI® ELEMENTS crystal on a black cord, part of Teleflora's celebrated Flowers-in-a-Gift collection. 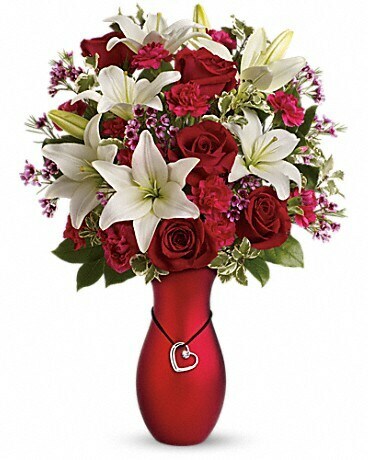 The perfect 3-in-1 gift bouquet, vase and necklace!